The importance of Eric’s on Mathew Street, Liverpool can’t be emphasised enough; not just for its cultural and historical significance in the punk era in the late 70s, but also due to the fact that OMD simply wouldn’t have existed without it; a fact recently confirmed by the reformed synthpop pioneers. Without the avuncular Roger Eagle’s mentoring, and a serendipitous meeting with future manager (and van owner!) Paul Collister, it’s difficult to speculate as to what would have happened next without such key players in OMD’s history. 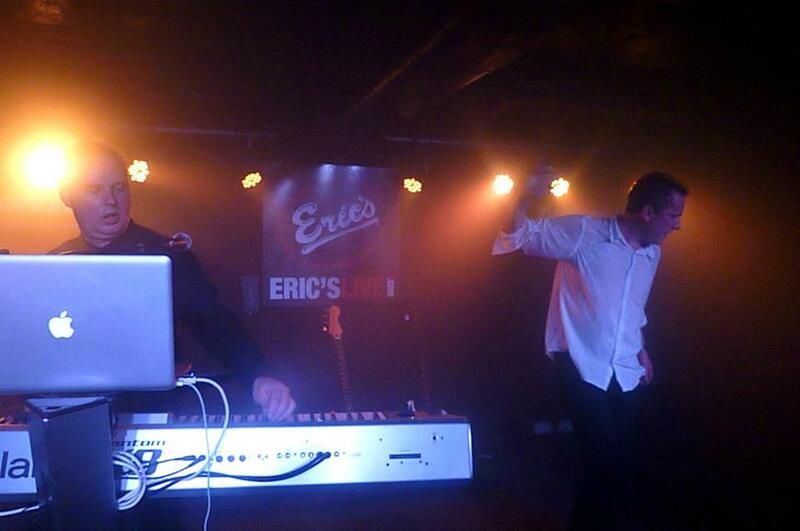 Eric’s has steadily gained legendary status over the years. More recently there has been “Eric’s The Musical” which was performed during Liverpool’s European Capital of Culture year in 2008, and a book (sub-titled “All the best clubs are downstairs, everyone knows that”) by Jaki Florek and Paul Whelan which was published in 2009. Eric’s first opened its doors in October 1976, and was named after the jazz musician Eric Dolphy. Its founders were the aforementioned Eagle, Ken Testi and Pete Fulwell. Eagle had moved to Merseyside in the early 70s and was involved in converting an old boxing venue (Liverpool Stadium) into a popular concert hall, which performers such as David Bowie and Lou Reed would play at. He also helped to set up Probe Records in the centre of Liverpool when it moved locations in 1976. Liverpool’s famous record shop would become a popular meeting place for aspiring local musicians, and Merseyside luminaries such as Pete Wylie and Paul Rutherford also worked there for a time. 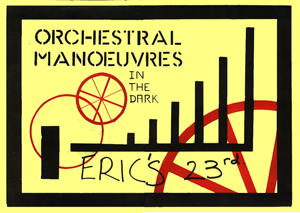 Roger Eagle certainly seemed to have a knack for booking bands on the brink of mainstream success, and one of these bands was a preposterously named band from the Wirral called Orchestral Manoeuvres in the Dark. Of course, Eric’s wasn’t averse to featuring bands with outlandish names. The ‘Crucial Three’ of Ian McCulloch, Julian Cope and Pete Wylie would all cut their musical teeth here with, respectively, Echo and the Bunnymen, The Teardrop Explodes and Wah! Heat. In fact, viewing a list of local acts that played at this world famous venue almost reads like a who’s who of the Merseyside music scene that blossomed in the late 70s and early 80s. Other frequenters of this scene included the cult band Big in Japan, whose members included Holly Johnson (later of Frankie Goes to Hollywood) and Ian Broudie (Original Mirrors, Care and The Lightning Seeds), as well as Bill Drummond who would later start Zoo Records, form the KLF and controversially burn a million pounds! And there was also Nightmares on Wax featuring the charismatic Pete Burns, who would later achieve great success with Dead or Alive. 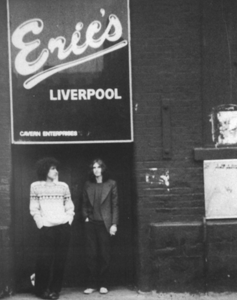 McCluskey and Humphreys already had live experience at Eric’s with The Id under their belts and the venue was the logical place to test their material, which at that time included the likes of ‘Electricity’ and ‘Red Frame/White Light’. The fledgling duo booked themselves a slot in the converted cellar in the autumn of 1978, the precise date of which remains something of an unsolved mystery. Their official biography states it was on the 12th October 1978 but there is evidence to suggest it may have been 2 weeks prior to this. Fast-forward over 31 years on from the closure of Eric’s in March 1980 and the Eagle has relanded. McCluskey and Humphreys are back to relaunch Eric’s, generously helping its enthusiastic musical director Ethan Allen to put the refurbished club back on the cultural map. This won’t be the first time the duo have visited the premise in recent years, having been filmed taking a nostalgic tour of the dilapidated venue for 2007’s Souvenir documentary DVD. 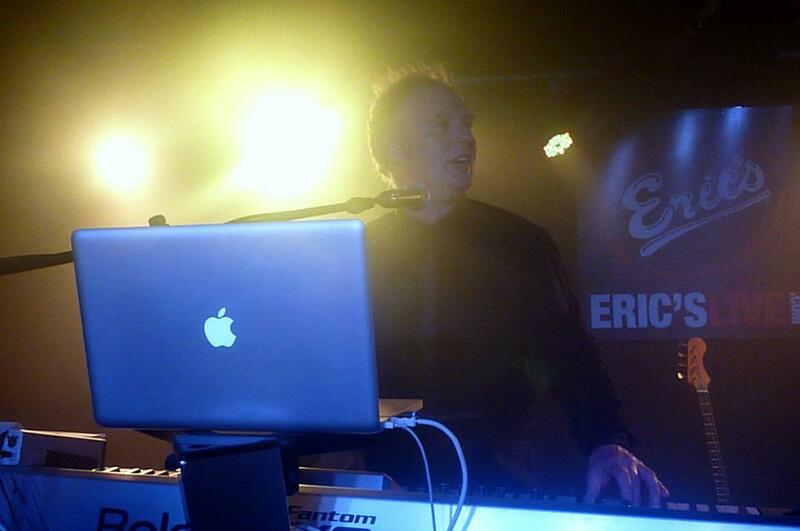 Other established acts confirmed to play at Eric’s in the near future include The Christians and Terrorvision, and there are plans to invite back bands who played during the club’s first incarnation. However, like its heady early days, it will also be an outlet for up-and-coming acts such as Kids on Bridges, a local trio of self-styled “filthy electropop” exponents who cite OMD as an influence. It seems appropriate that they provide the support for OMD during an invite-only gig on September 10th, and thus become the first act since the Psychedelic Furs in March 1980 to perform in the famous basement. BBC 6 Music’s popular DJ Mark Jones provides a nostalgic array of tunes in between sets. The venue has been faithfully recreated, although the stage has been lowered to prevent artists from bumping their heads on the beams (Elvis Costello famously banged his head on a beam and left the stage mid-set!). Original graffiti also adorns the walls where the dressing rooms once were. By the time Humphreys and McCluskey arrive on stage just after 9.30pm, following a rousing introduction from Ethan Allen, the venue is heaving and the apparent lack of air conditioning makes for a rather uncomfortable (and sticky!) experience. However, all that is forgotten once the first strains of ‘Introducing Radios’ reverberate around the one-time storage area. It’s a wonderful ode to the past, having first appeared on a 4-track EP that was originally given away with initial copies of Organisation in 1980 (the tracks had been recorded live at the Factory Club in Manchester, and at Henry’s). Whilst there is no Winston on stage (he’s ensconced in a local museum), we do get Humphreys’ laptop which has a low battery and has to be plugged in to the mains before it dies mid-set! There is a party-like atmosphere on and off stage, with McCluskey and Humphreys ostensibly revelling in the occasion and enjoying the break in between touring commitments in Europe and North America. The performance is raw as they sweat through obligatory set mainstays such as ‘Messages’ and ‘Souvenir’; the musicianship is rough and ready but no-one seems to mind. Understandably it’s the material from the duo’s formative years that draw the biggest cheers – it’s an absolute pleasure to hear both sides of debut single ‘Electricity’/’Almost’ played back-to-back, but it’s the inclusion of ‘Julia’s Song’ that is the biggest surprise, having not been performed by any incarnation of OMD since the mid-80s. McCluskey looks nervous as he sings his former girlfriend’s words in tandem with the familiar cyclical bass line, but it’s a triumph. The 35-minute performance isn’t entirely about revisiting the past though, and the duo duly perform 2 of the best tracks from 2010’s hit-and-miss comeback album. The 3-chord monster that is ‘History of Modern (Part I)’ is a veritable tour-de-force; its memorable and instantly recognisable melody ingraining itself in the conscience just like the material from their heyday used to. The beautiful ‘Green’ is a far more emotional affair, with the Roxy Music-inspired coda paving the way for the now-traditional ‘pastoral’ sequence in the show that ends with ‘Maid Of Orleans’. Appropriately, a truncated ‘Once When I Was Six’ closes the set with its juxtaposition of haunting melody and Dave Fairbairn’s memorable “you have been listening to…” spoken words. We don’t quite get the encore we hoped for, but another run-through of ‘Electricity’ is gratefully received. What the future holds for this iconic venue remains to be seen, but it’s certainly been relaunched in style.